In a recent Class A minor league baseball game, the Delmarva Shorebirds trailed the Augusta Greenjackets 4-3 in the top of the ninth inning. Then, Shorebirds outfielder Elier Leyva hit a 2-run homer that put his team up by one. Or, so it seemed. As he finished his tour around the bases, Leyva failed to touch home plate. 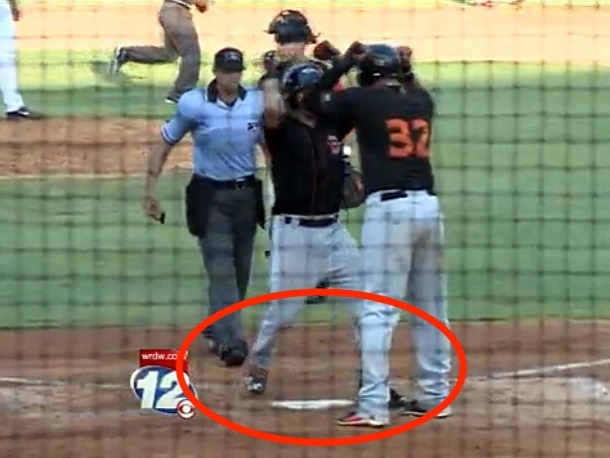 The Greenjackets players noticed the mistake and appealed to the umpires, who then called Leyva out. The game went into extra innings, and Augusta won by a score of 5-4. This was a classic case of snatching defeat from the jaws of victory! Too many Christians think they have it made because they once made a decision to follow Christ. The Bible consistently urges us to persevere in the faith, and it contains dire warnings for those who fail to remain faithful. Make sure you touch home plate! “…Be faithful, even to the point of death, and I will give you the crown of life.”—Revelation 2:10. This entry was posted in Christian Living, Sports and tagged Augusta Greenjackets, be faithful unto death, crown of life, Delmarva Shorebirds, Elier Leyva, heartbreaking loss, illustration, missed home plate, perseverance, Revelation 2:10, victory. Bookmark the permalink.